The Best Battle and Skill System EVER!!! This game has possibly the best battle system there is, it is completely real time. I don't mean like real time as in you attack and you have to charge up, I mean completely real time. You can attack as much as you want and so can your enemies, so you can go through a battle without getting hurt at all! During battle you control one person and the rest are computer controlled, you can switch during battle if you need to, there are certian settings that you can choose for computer controlled charcters such as, run, heal friends, protect friends, attack enemy, conserve MP and so on. During Battle you can also move anywhere on the screen. Along with [the great] battle system there is also the skill system which is very good. Every battle you get skill points and those can be used to level up and get new skills, if you get a certian combonation of skills you get a command that can be slected from the item menu. The skills can be used to identify items, make new items, make new armour and make new weapons. There is one skill that is called pickpocketing, if you get a certian item you can got around and steal items from people (some are very, very good). I've been an RPG fan for longer than I can remember, and have played around 70 of em. Despite the VERY harsh review of gamecritics.com, I thought this game was actually really good. A nice breath of fresh air from the very linear, but nonetheless brilliant, Final Fantasy games. This game is one of the best out there!!! Graphics: Really nice 3D backgrounds and cute li'l 2D people! Battle System: Really cool! You have a few choices that have to do with how you fight the battle, you choose each character's strategy and the battle formation, you can control any character you want, attack your enemies in three different ways- by casting one of numerous destructive spells, using a "killer move", wich is a strong physical attack that uses up MP, like magic, or just run up to your enemies and slap 'em silly with whatever weapon your character has at their disposal. Oh, yeah, and you can also use a few items to win battles. Enemies: Not extremely hard to beat if your characters are at reasonable levels. Special Features: The PA (Private Action) system is very original. If you press square when you're near a town, your group will split up and you can talk to the members of the party (and sometimes the villagers will ask for your help or say different things to you). How you respond effects your character's romantic/friendship values with the other characters, and sometimes wins you an item or two or some money. At the end of the game, your characters will be paired up according to their romantic/friendship values with each other. 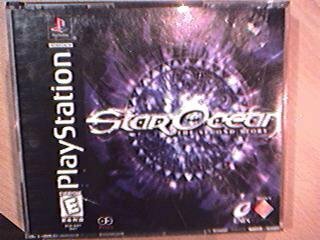 Star Ocean 2 is an excellent game that did not get as much attention as it deserved... but, I suppose that's a blessing in its own way since it kept the prices down and allowed me to get it extremely cheap. The storyline is not cliched or unoriginal, as some might think. I hate it when people take a completely unique story, ignore all of its distinctive features, dumb it down into a bunch of sweeping generalizations, and then call it unoriginal. The characters are far more likeable than the heroes Square has been churning out lately. This story is a lot more lighthearted than Square's latest stories too, which will be seen as good by some players and bad by others. I personally like the brighter and more heroic overtones of this game since it reminds me of Squaresoft's SNES titles, back when they truly did their best work. The sound effects are decent, though there aren't many of them except for special attacks and impact sounds. The voices are good... not perfect, but good. Sometimes their dialogue can be rather cheesy, but I haven't found any cases of bad translation or poor grammar. Whoever said this game had poor translation needs to take a closer look at some of Square's latest titles, especially FF7 ("Don't give her it"). And, it's a cool effect to have characters who speak during battle, and will say things in response to what happens in the fight. The music is excellent, definitely reminiscent of the inspiring tunes of the SNES titles. Each town has a different song with it, and the music in dungeons and the like will easily set the atmosphere. The battle music is also fast-paced and catchy, as battle music should be. The battle system is awesome, combining some of the best aspects of action and strategy. The fights are real-time, but the action is paused while you use menus, much like the original Secret of Mana. Also, like Secret of Mana, you can assign your AI-controlled partners different things to do in battles, and they are very good when it comes to following your commands. If you tell your healer to heal and stay away from the enemies, she will do just that. You can choose various formations for battles. Another interesting feature is that special attacks will use different effects depending on your range from the enemy. For example, one attack called Air Slash will slice a circle around you if you are close to enemies, but will send a cutting shockwave across the field if they are at a distance. The character development aspects are wonderful. You can to some extent control which characters will like others and how well they get along. And, the closer they become, the more interesting things can happen. This can even effect battles. These aren't major things, but they certainly add a lot more depth and personality to the game. You control which skills the characters learn as well. Not only battle skills, but also metalwork, alchemy, cooking, art, photography, music... all sorts of things. And, all of the skills actually have some good use to them, rather than just being there as a gimmick. The graphics in this game are good as well. They are rather cartoony, but the cartoon style conveys personality and emotion far better than polygons do. There are also more subtle touches that add to it, such as birds flying over, seeing your character darken when you walk through a shadow, and seeing your reflection on water surfaces. I have been shocked to see the low prices for this game on most websites that sell video games. I have one memory card dedicated to just this game, and it is well worth it. I have one saved game with Rena and Claude as my main character, and played them through until Claude saves Rena, then I move on and save somewhere else as I continue to play. This allows me to avoid starting over and having to sit through the first, linear part of the game over and over. The ability to create so many different items, and to steal from people in towns (including your own party members) as opposed to monsters like in most games is a unique aspect of this game that is really enjoyable. You gain skill points by leveling up, or you can have characters who have those skills write books about them so other characters can learn the skills by reading instead of alloting points. There are limitless items that can be used to heal party members, including tons of food items that you can create. There are certain items and abilities that make it easier to create items or make better items, and you can even duplicate most items by taking pictures of them. I enjoy disc two much more than disc one because that is where all of the fun and increased abilities really begin, but for the most part the fun of the game for me is the item creation and the mini-games as opposed to the endings. There are over 80 endings, but after all of the private actions work on getting characters together, those endings leave a lot to be desired. They are just too short in my opinion. The voice collection part is another intruiging part of the game, making it better to level up all characters in different games as much as possible and to escape and use "Provocation" with all of the characters. You can replay the game at harder levels with the voice collection, and you can listen to more music. You should have a strategy guide when playing this game at least the second time through, or you will miss a lot, including "Mischief", and there are plenty of strategy guides available for free on the net. Oh, and don't forget to make sure that your main character has DEXTERITY or you will have serious problems pickpocketing. If you like to just get through a game, or don't have the patience to try to create the best weapons and items then this game might not be for you, but to me this is the best part. The battle system can be difficult at times, but the ability to make the forged medals and reproduce them to level up your characters with every battle will rapidly provide you with stronger spells and abilities. Another nice touch is that you can reload a game if you don't steal the item you want or make what you want, or even if the treasure box item doesn't give you something good. In most games you have to restart the game in order to do this. The sequel to the game of the same name(which unfortunately was never released in America), Star Ocean 2 is the perfect RPG. The skill system is one of the things that sets it apart from any other game. There are around 40 skills to learn with 10 levels of profiency each(each of which requires a certain number of skill points to learn, which are gained when you level up). Combat skills are automatically executed, with the frequency depending on how many levels you have invested in the skill(examples, "flip" lets your character quickly move behind the enemy, where his defensive power is lower. "parry" lets you block attacks, "motormouth" lets you cast spells faster). The other skills have 2 purposes. They have an initial bonus to investing in them, and they can combine with other skills to produce specialty skills. For example, "kitchen knife" adds a huge boost to your strength stat, and if you add "recipe" and "good eye", you will acquire the "cooking" super specialty skill, which allows you to create very powerful healing items out of base components(you can even make french toast this way!). If multiple characters have a high cooking skill, the super specialty skill "Master Chef" becomes availible, letting you make even more powerful healing items. There are similar skills for producing weapons, armor, and accessories. Other skills, like art or authoring, lets you make pictures to sell or books to publish, which can result it huge amounts of cash for you. There is even a skill that reduces the experience requirement for levelling up. This is the "tip of the iceberg" so to speak, so I will just say that the skill system is above and beyond any other game that I have played. The combat system is also excellent. You have 4 characters(out of a maximum of 8 in your party, which is out of 12 characters in the game) fight in real-time combat against enemies. You control a single character at a time while the rest follow the tactics that you set, and the AI for this feature is also well done. Your fighter characters have an assortment of "killer moves" instead of spells that let them unload a series of special attacks against the enemy. Words can't describe the flawlessness of this combat system; you would have to watch a trailer to get a real feel for it. The basic game is sufficiently challenging, but once you have played through the game you will be able to access higher difficulty settings(which are very very hard), which, combined with the variety of characters you can recruit, make for lots of replay value. Also of worthy note is the voice acting. Your characters will strike, yell, taunt, and basically talk during combat. They cry out a character's name who has just fallen to the enemy. If you have played Grandia 2, you will have an idea what I am talking about. The sound quality is clear and easy to understand, though when Claude yells "Tear into pieces" it sounds like he is saying "Pear into peaches!". Plot is excellent, with a huge thing at the end of disk 1 that rivals Aeris in Final Fantasy 7 in terms of its impact on the plot. Terrific fun, great story, great music. This game is wonderful. You can play as one of two people (something I really like in games), skills are actually terrifically *important*, the graphics are good (not great, but good), and the music is outstanding. The difficulty levels are well-set up too; there's not much of 'I must run around and fight random battles to survive my next dungeon'. The fight system is rather odd, but learnable. For those of you who are reading this review, this is the edited review, not the previous one of mines. This game has so many items (over 11000)! the graphics are really good for the time period it was made. the story is easy to understand. there are many characters to unlock while you travell around two vast worlds! you can always choose your battle type which makes this game more fun. there are three battle types full control no control and semi-control. these make the battles suit the person playing the game. once you start playing you wont want to stop thats a guarantee! This is undoubtedly one of the best RPG's I have ever played. Your choices are almost limitless - you choose the main character, which characters to include in your party (some are not compatible with others, and some you can only get playing as a certain character), how to assign your skill points, and what specialties to develop in each character. The skills that the characters can build are varied and useful. A character might learn cooking, metal working, weapon customization, alchemy, photography, music, painting, writing - it's all up to you. And the results of these skills affect the gameplay. For instance, a character good at cooking can create a dish that will restore HP or MP to whoever consumes it, while a character skilled in alchemy can turn a rock into a precious gem that can be used to customize an ordinary weapon into something spectacular. You also affect the final outcome by which characters you place together in battle and how you choose to have them interact while not in battle. There are so many choices, and so many ways to affect the game, that its possibilities are staggering. As the game is so multi-faceted, I do recommend the strategy guide. Knowing which characters are compatible with others, what foods are needed to cook specific dishes, which good weapons can be customized into great ones, etc. can help you make good decisions. After the linear-style of Final Fantasy and other similar RPGs (Which I love BTW), I found Star Ocean 2 a wonderfully refreshing experience. There are just so many options - starting from the beginning, you can choose your main character, which other characters you want and take it from there, eventually leading to one out of 86 different endings. It's true that the endings stem mainly from the different combinations of characters that get together in the end...but 86! What other game can boast so much replay value? The item creation system is very unique - cooking, art, machinery, authoring, customising...it's all within your power. You choose the skills and specialities the characters learn. They write books for the other characters to read, make better weapons, compose music and create delicious (or not so delicious) dishes. They can even combine their skills to make super specialities, which allow you to get better at cooking, publishing, etc, and my favourite - where all the characters sincerely call Barney, a giant white rabbit to cart you around the countryside. Hilarious. The graphics IMO are pretty good. The 3D backgrounds are lovingly rendered, even including really cool minor details like your reflection on a pond or in a mirror. Nice. The characters themselves are 2D sprites, which looks better than it sounds - no hassles with fuzzy polygons or anything like that. And Links has done a fine job (as usual) on the FMV - great eye candy. The battle system allows you to take a much more active role in combat situations. In active mode, you basically dash around and try to konk the enemy without them hitting you. Fighting characters have Killer moves, which are special attacks that are assigned to the L1 and R1 buttons. They look cool and wreak havoc on the battle field. For magic users, the spell animation is nice too, and there is the interesting possibility of combining spells by casting them at the same time, which can lead to greater damage if done properly. If I do have any complaints, they are generally not the fault of the game, rather the people who were supposed to be checking for bugs. Firstly it crashes - no game has ever crashed on me like this one. So save a lot. And there are little things, like the character voices getting mixed up - it is so funny to hear Precis yelling 'Parabola Beam! ' while Claude is doing Mirror Slice, and the wrong word appearing for spells. I guess I'm nitpicking. As for the game itself, I find some of the character's voices rather irritating. But that's a personal thing. The music _is_ rather repetitive...they play the same tracks over and over, but even so, they still sound nice. I only borrowed this RPG for about one month and I was hooked. The reasons are the music is better than any game (even some non-video game music) ever. The options are more varitied in choice than any RPG ever, such as skill, abilities, magic, characters etc... And the battle system is the best there ever will be, with free movement, give commands to AI controlled characters, choose the starting posistion before any battle and up to four characters on your battling party. As opposed to some Final Fantasy games this one's by far better. There's just one con, the story isn't so well thought of, but it's hard to change the story when there's 86 possible endings. Though I never beat it when I borrowed it I must have it. A great idea that needs a little more work. You start out as one of the two heros of the game, on Renas home planet Expel. Something strange has crashed on Expel and is causing chaos. You now need to go learn more about it and discover what it is. But that is only the beginning. Your travels takes you to several villages and towns, meeting several party members you may choose to go along. Earn skill points to boost your skills such as Cooking, Writing, Alchamy and Reverse side (forgery). As you continue through out the game you can increase or decrease party members attitudes twards each other, in result earns you special endings. You can see up to as many as 80+ endings. Pros: Smooth fighting style, Beautiful music, very high replay value and interesting story lines. Not to mention frequent save points. PA (private actions) are one the the highlights of the game, where you can intereact soley with another party member. Cons: Some mage scenes in combat can take a few seconds to finish, easy to over look. ~sometimes~ Will lock up after a fight. This is very rare but can be a pain. The grapics are alittle old style, but nothing to really complain about. Star Ocean the second story is my favorite game of all time. (and I've played some of the best games like Halflife2, Final Fantasy Series, Zelda series and many more) The most memorable is Star Ocean the Second Story. It was my first RPG and I played it at the age of 15 (I'm 25 now), ten years and still can't get over it. I can't even name a movie, book or any other form of media that I've admired for so long. Just to show you how heavy an impact video games have. I can't mention how the game works as it has been a long time, but I know that I finished the game three times as a kid and it took me about 50hrs each time, but it will last a lifetime in my memory. Most Innovative RPG in Ages! All gamers have had the experence of playing a game (be it an RPG or anything else) they felt had its fair share of flaws, but has that one, very bright redeeming quality that makes all those flaws take a backseat to that one positive. Star Ocean: The Second Story is one of those games. Star Ocean's appeal (at least in my case) can be summed up in a single word: combat. Star Ocean's combat system is probably the game's most notable feature. The real-time battle system, which has a very arcade-like feel to it, is a very enjoyable change than your standard-fair RPG battles. It's just so much fun to destory enemies with a volley a special attacks from you and your allies. The skill system is also a plus as well, increasing characters stats and developing other usefull, non combat skills. Unfortunately, the rest of Star Ocean's elements aren't quite up to par when compared to the hustle and bustle of battle. Graphically, Star Ocean is behind the times no matter where you turn (excluding the FMV's). Actually, the game's graphic engine is very simular to a 1998 Square-Enix title, the often overlooked and bashed-to-no-end SaGa Frontier (one of my favorites - yes, I'm serious). The fact the game uses most of the same graphical tricks empolyed by a game two years earlier underlines this fact. Storywise, Star Ocean 2 suffers another, slightly smaller blow. While the story is generally good, it seems to drag on until you reach the second disc, where you do more exploring and fighting and the story begins to unfold more. Characters aren't as developed as well in Star Ocean compared to other RPG's such as Final Fantasy or Wild Arms, though the game tries to make a very obvious effort to do this though the use of the private actions system (where you enter a location and your characters split up and you can talk to them on a one-on-one basis to discover more about them - this affects the outcome of the game in various ways). I will give the developers credit for trying though. Musically, Star Ocean 2 has it's ups and downs. Some of the tunes can be quite annoying, but no game score is without it's duds. However, when you hear the battle themes played near the end of the game for the final bosses, which mainly are of heavy rock/metal variety, all is foregiven. Soundwise, the characters various soundbites during battle are cute at first, but become annoying really quickly (how many times can you remember Claude saying "that's around 50 points" after a battle - too many to admit when I'm sober). Even with it's flaws, Star Ocean: The Second Story is an above average RPG. While I'm not sure if I would call it a "classic", I would recommend it to anyone who had the time or showed interest in the genre. This game is one of my most favorites. I haven't made it all the way through yet, but I simply love it. The game has a few flaws. The voice acting is kind of lame, the story is WAY too boring at the beginning, and it seems pretty difficult at times. RPG fans MUST play this game! When you start you'll never stop!